Georgia Dominates, Lands Nations Number 1 Class. On National Signing Day, Kirby Smart and Georgia secured the nation’s consensus top-ranked recruiting class. Not long ago, Georgia defeated Oklahoma in the Rose Bowl to advance to the College Football Playoff Final. That historic triumph might not be the Bulldogs’ biggest victory of the year. 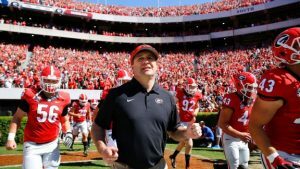 On National Signing Day, Kirby Smart and Georgia secured the nation’s consensus top-ranked recruiting class, signing one of the most-heralded hauls in the history of such evaluations. Entering the stretch run, the Bulldogs had already positioned themselves near the top of the rankings. Blue-chip talents like quarterback Justin Fields, running backs James Cook and Zamir White, offensive linemen Jamaree Salyer and Cade Mays and defenders such as Adam Anderson and Brenton Cox had already put pen to paper. Georgia, by the first early signing period, had much of its future already in place. On Wednesday, Smart, somehow, continued his torrid pace. The Bulldogs didn’t just win this recruiting season, they dominated. Georgia reached into South Florida to sign five-star cornerback Tyson Campbell from American Heritage in Fort Lauderdale, the same high school as former players Isaiah McKenzie, Sony Michel and Marshall Morgan. Smart went head-to-head with Nick Saban and Jim Harbaugh, getting star linebackers Quay Walker and Otis Reese to de-commit from Alabama and Michigan, respectively. Late in the afternoon, Georgia added 6’5” receiver Tommy Bush from Texas. At the end of the day, including the prospects who signed pre-Christmas, Smart had inked eight five-star recruits; combined, the rest of the SEC landed four. Though the Bulldogs came up just short in the national championship game, Georgia is currently the hottest program in the country. The Bulldogs, on National Signing Day, are alone atop college football, winning with a momentum currently beyond measure. Read more of BJ’s work on Southern Pigskin.